Pretty scenes from our little backyard garden. As our tomato plants slow down and our sunflowers droop, I realized I hadn’t shared some of the beauty that is our little backyard garden. It’s not the It’s Complicated garden, but I love it. I hear people say “I don’t have a green thumb. You’re so lucky you can garden.” But I don’t believe in green or black thumbs. Maybe for some people gardening is intuitive. It definitely is not for me and I’ve killed many a plant. Like anything else, growing food and flowers is a learning process, and you can’t expect success without studying. The first year of my “garden” I planted a single zucchini plant. The next year I planted some herbs, strawberries, and one cherry tomato plant. 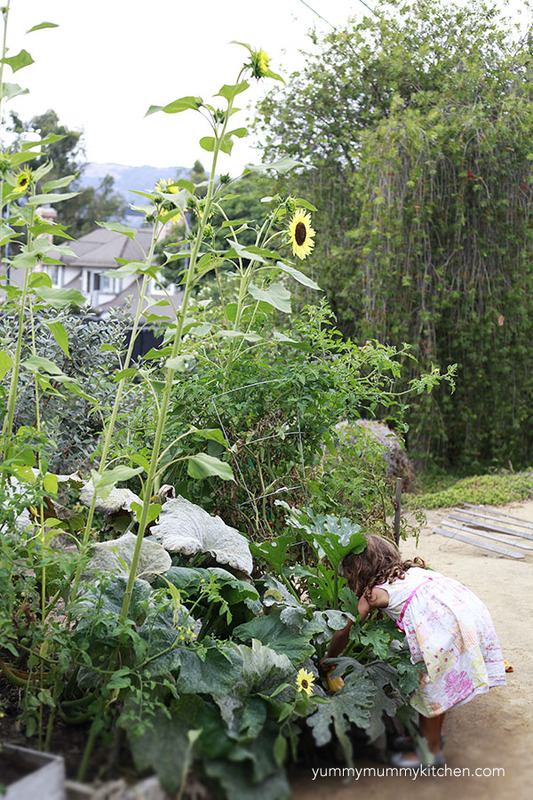 Each year I’ve become more comfortable with gardening and learned how much water, light, etc. each of my plants need to thrive. This summer was our best garden yet, and I’m going to be very sad to go back to buying tomatoes. There really is nothing better than a sweet tomato right off the vine. Even though summer planting is over, I hope this post inspires to you to go plant some herbs (they are SO overpriced in stores), winter greens (hello kale chips! ), or butternut squash (yum!). Cute little gardener looking for squash and cherry tomatoes which have grown rather wildly together. I’ll separate them better next year. We grew sunflowers for the first time this year. They made me so happy every time I looked out the window. Next year we will try harvesting the sunflower seeds. They have to be harvested after the flowers are dead and completely dried out, and I didn’t want to keep them around that long this time around. 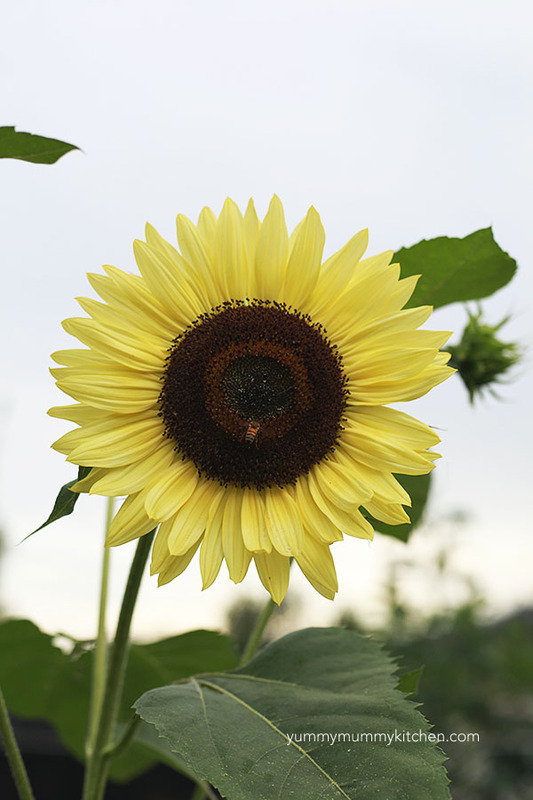 Sunflowers attract bees to your garden and look pretty. Last year the wild rabbits mowed down the seedlings, so this year we planted them inside the planter bed. Sorry bunnies. Can’t forget our sweet egg-layers. 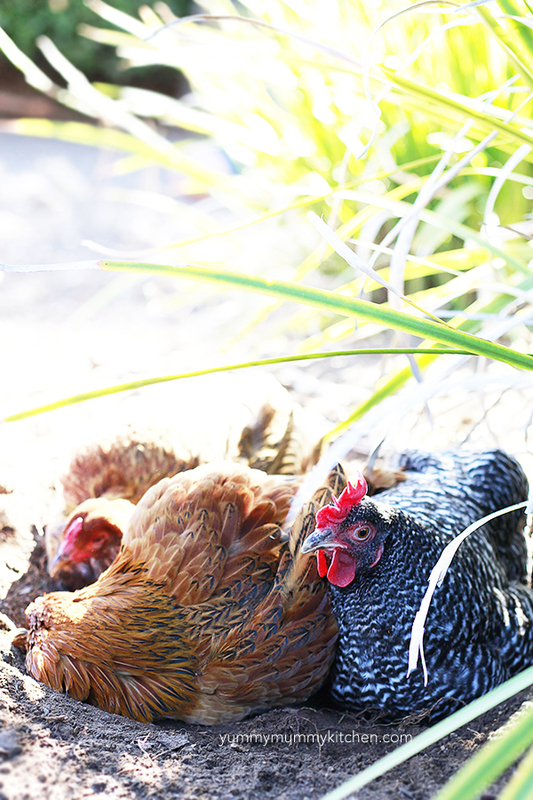 Chickens absolutely love rolling around in warm dirt. Baby Haas avocados. In a few months we will have creamy avocados ready to eat. These are definitely my favorite crop and we go through about an avocado a day, so planting a tree was a given. Roses in bloom. In August we celebrated our 8th wedding anniversary and I bought Yummy Hubby this climbing rose in a terra cotta pot, as the traditional gift for year 8 is pottery. This lovely is a David Austin rose. If you aren’t familiar with David Austin roses, they are the prettiest heriloom English roses. 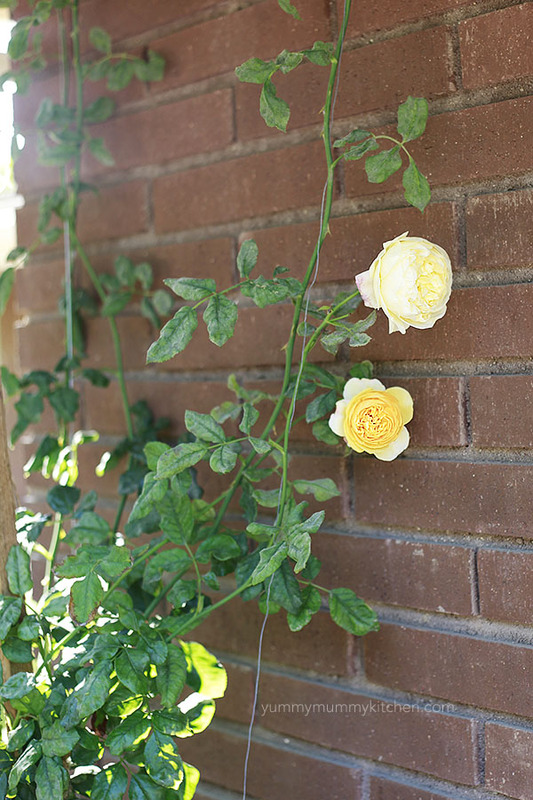 This yellow climber is called “Graham Thomas“. 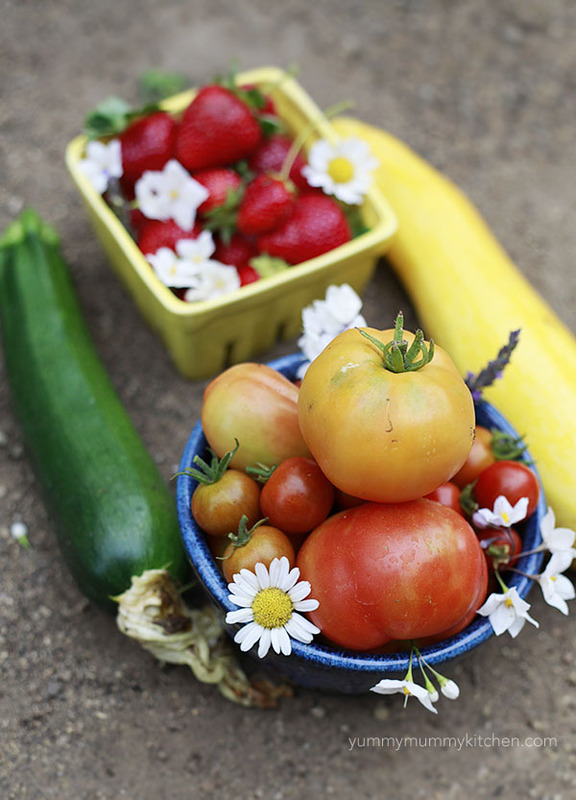 One of my favorite things about gardening is being able to give some of our beautiful harvest to friends. The perfect hostess gift, right?! P.S. 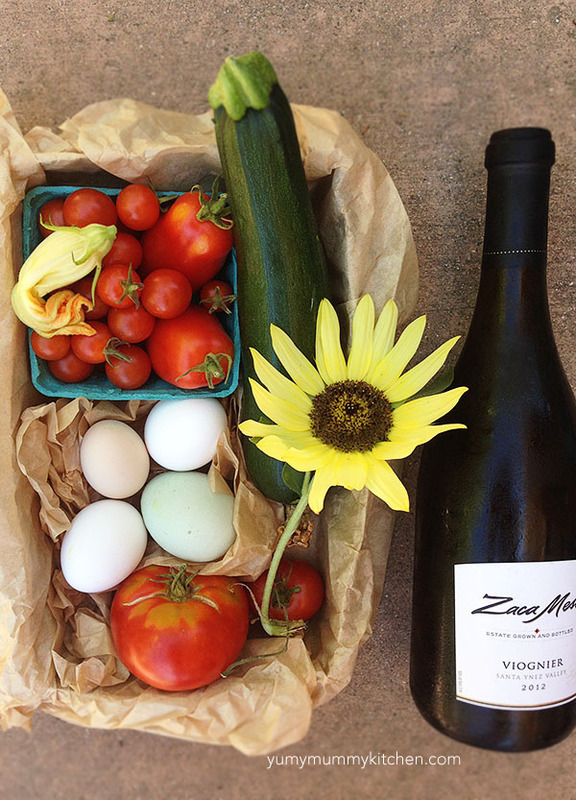 I really liked this viognier from Zaca Mesa. So yummy. My friends are garden-gifters too. 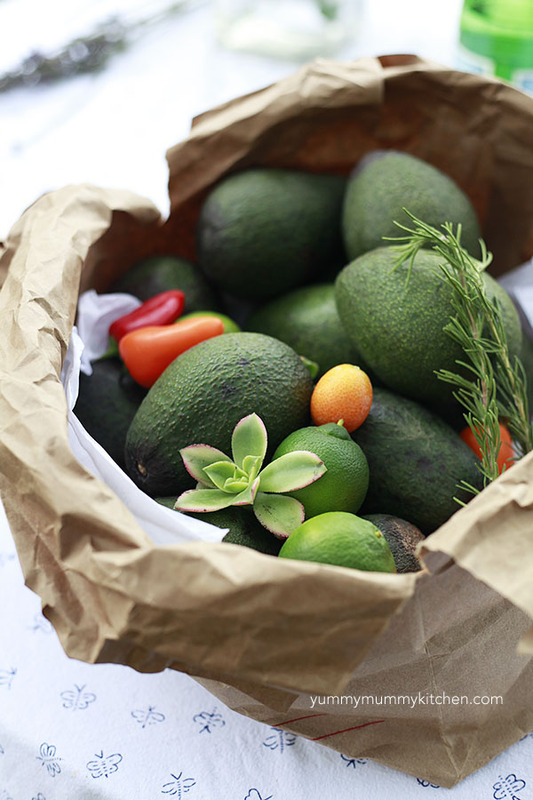 My friend Elena brought me this incredible guacamole package filled to the brim with her homegrown avocados, limes, baby bell peppers, kumquats and succulents. Stunning. 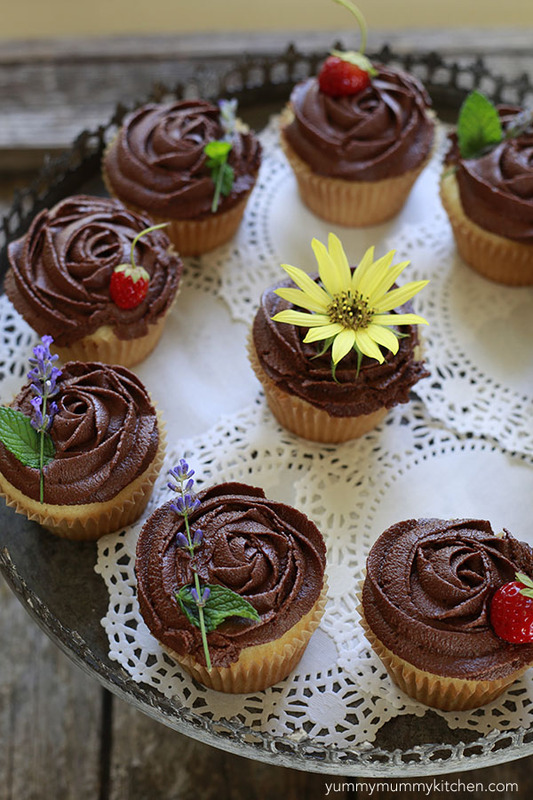 For a baby shower for my friend Danielle, (Delightful Mom), I made cupcakes topped with organics from our garden. Aren’t these just so so so much more lovely than artificially colored sprinkles?! Coming soon: passion fruit! 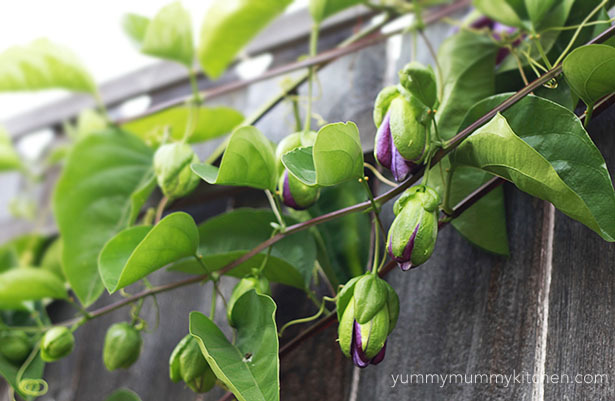 If you live in a warm climate, I highly recommend planting a passion fruit vine. 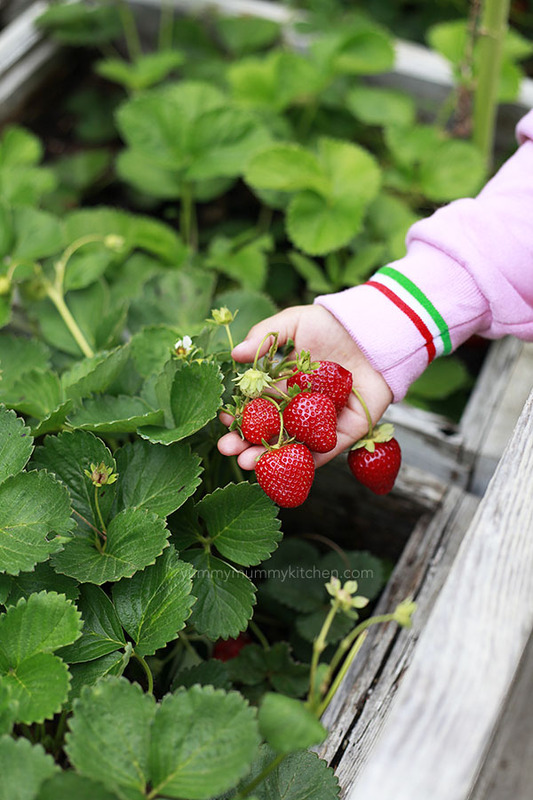 They grow very quickly and produce beautiful flowers and delicious fruit. 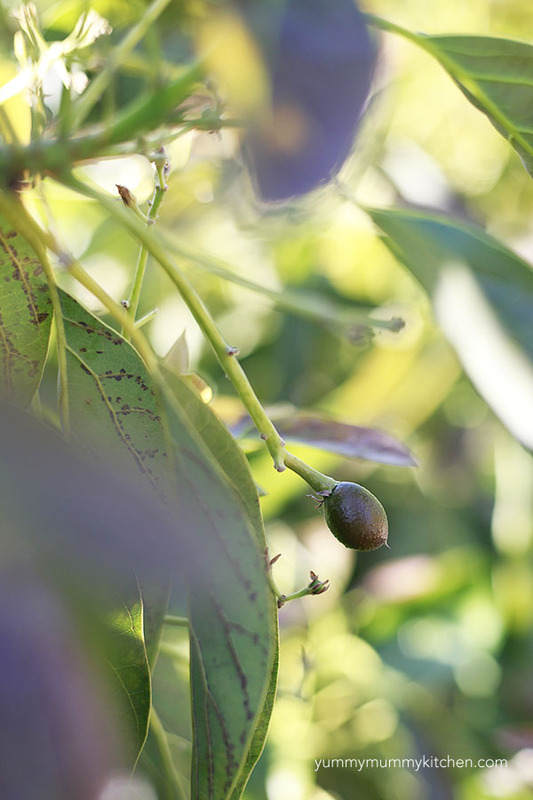 Like avocados, passion fruit can be expensive, so it’s a great thing to grow yourself. And of course, the garden never lets you forget that the next season is right around the corner. 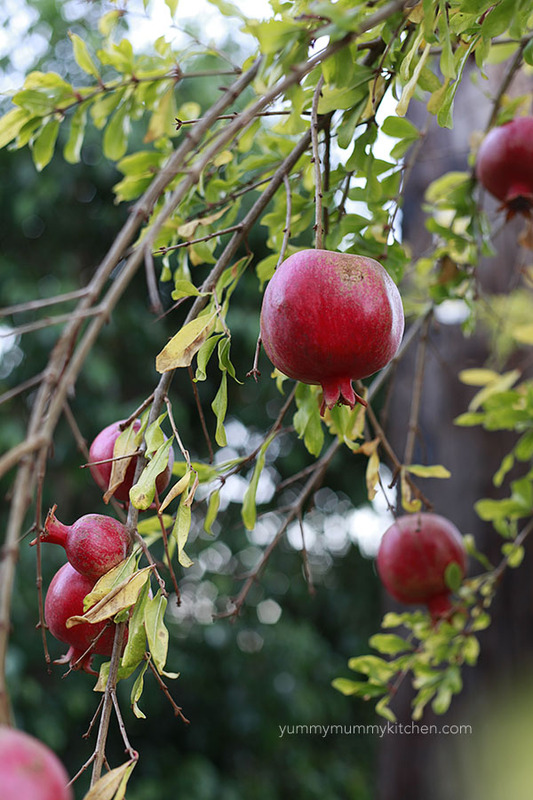 Pomegranates are almost ready! Goodbye, summer and hello fall! I need some inspiration for fall/winter planting. 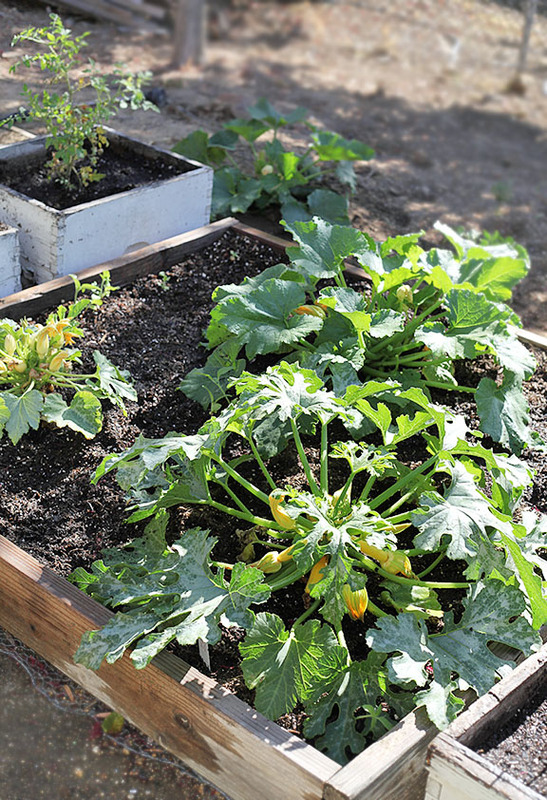 What are your favorite things to plant?